To be honest, as a dog mom and crazy dog lady, I’m surprised that the pet Halloween costume participation rate is so low. Even so, the NRF says the number of pet parents participating in Halloween is actually up from 2017. Another survey on pet parent participation is the 2018 Goodwill Halloween Poll. Thrift stores like Goodwill are a super popular place to go shopping for Halloween costumes, even for pets. That survey showed 10 percent of respondents will dress their pet up for Halloween, a trend that’s particularly popular among millennials. Fifteen percent in that demographic group saying their pet will wear a costume. This list seems spot on. 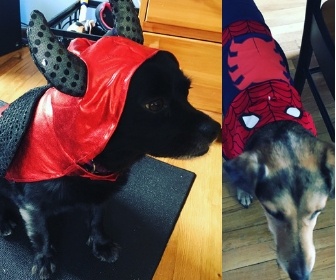 I know last year my dog Sadie got a devil’s costume (so appropriate for her personality) and my dog Oscar a Spiderman costume—all courtesy of the folks at PetSmart who sent them a Halloween care package. I’m not sure yet if we’ll be recycling those costumes for Halloween 2018 or if we’ll go shopping for new. In case you’re in the market for an on-trend Halloween costume for your pet, check out the photos below for 10 ideas on how to dress up your pet for Halloween 2018. Some of these ideas match with the top 10 list above. Others are simply so adorable that I had to include them. PetSmart carries the DC Comics line of both Superman and Supergirl costumes for dogs. Amazon has a DC Comics dog version of a Wonder Woman costume, and Chewy.com has both Batman and sidekick Robin. But I’ve got to give props to Jet.com for this The Flash costume, which is simple yet adorable and, frankly, so appropriate for a dog with boundless energy. Dogs either love or hate the UPS Truck. There’s even a Facebook page devoted to dogs greeting their favorite UPS driver. This year Chewy.com helps you dress your pup up as their favorite delivery person. This ketchup on hot dog costume from Chewy.com shows that your dog’s breed definitely does not have to be a wiener dog to pull off this costume. The store also sells other “food” costumes, including a slice of pizza and a taco. Your pup will be all the buzz with this bumblebee costume from Jet.com. This one-piece pumpkin costume from PetSmart might work well with a dog that’s OK with wearing a winter coat—as it attaches with two Velcro straps like a coat does. You can turn pretty much any pup into the pride of the neighborhood with this lion headdress costume from Jet.com. The only challenge, I would think, is getting your dog to keep it on their head. I know how much mine hate hats! Rubie’s brand pet costumes has a number of Star Wars options on Amazon.com, including a Jedi outfit as well as one that makes your dog look like an Ewok. I love on this Jedi costume how there’s a cutout for your dog’s ears. While I can’t imagine dressing up your dog as a dog for Halloween, I think this skunk costume from PetSmart is totally adorable. Why not kill two birds with one stone and buy your pup a holiday-themed costume for Halloween this year? You can dress him up as a reindeer (like this costume from PetSmart), Santa or a snowman, and then reuse the costume come December. If your cat will let you dress it up for Halloween, you can find a ton of cat costume options on Amazon.com. I especially like this bat costume on a black cat, because it blends seamlessly with the cat’s fur. In fact, I may buy this for my little black dog, Sadie.